Shuriken LED Lamps Are A Great Way To Light Your Home Or Dojo | OhGizmo! Growing up I was fascinated with shuriken or ‘ninja stars’ as much as the next kid. I think it was partly because G.I. Joe made Snake Eyes out to be such a cool character, and partly because they were so hard to come by. I remember everyone having a friend of a friend who was rumored to sneak a couple into their suitcase during a trip, but I never actually saw one. As you grow up though, you realize how dangerous a sharpened metal star really is. I mean, just look what happened to Butters in the South Park episode ‘Good Times With Weapons’. 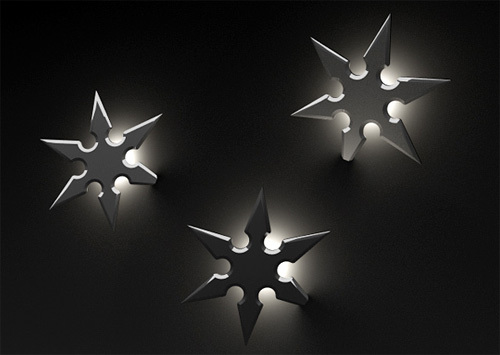 But there’s still some small, irresponsible part of me that thinks these shuriken LED lamps are pretty cool looking. While I doubt the installation process would be as easy as just throwing them at the wall, the effect of these sticking out all the over place would be well worth the necessary drywall repairs when you redecorate someday. Could you possibly send me some information about (Shurikens), please.